2018 saw the delivery of three Macmillan Wellbeing days designed to support people aged 55+, who are living with and beyond cancer, to get active have fun and feel better. 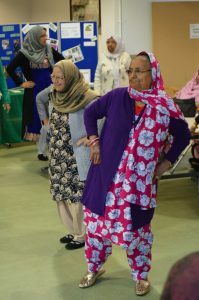 All events were organised collaboratively with established community groups in the East of Bristol, working to showcase the excellent services and wide-range of activities that Bristol has to offer. In a scaled back version of our larger Wellbeing Days, we aimed to hold smaller workshops that responded to the needs of diverse communities. The events needed to be inclusive; culturally appropriate, and valuable for participants. We know from reports that the Inner City and East locality of Bristol have a much larger proportion of black and minority ethnic groups (31%) in comparison with the North (12%) and South areas of Bristol (7%). Through research conducted by Macmillan Cancer Support, we were also aware that cultural factors such as stigmas around cancer and lack of knowledge are barriers for black and minority ethnic groups seeking support. Commencing the series of events was a workshop with the Evergreens Over 60s Club in October. Evergreens host a weekly afternoon social group for over 60s that is attended by people from many different ethnic backgrounds. Our Macmillan team introduced the morning with a short talk on the benefits of physical activity as a preventive of 38% types of cancer and the effectiveness it can have during and after cancer treatment. The cancer awareness information shared amongst members on the day was well received with one member joining us on the larger Macmillan Wellbeing Day that took place the following week. The group were warm and welcoming, and we look forward to working with them again in the future. 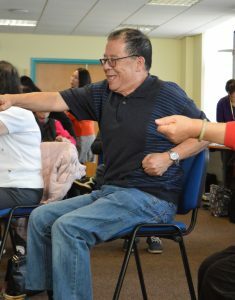 Collaborating with the Bristol and Avon Chinese Women’s Group (BACWG) on a Cancer Wellbeing workshop in mid-November was an excellent experience. The BACWG exists to support the health and social care needs of Chinese women and their families in Bristol and the surrounding area. The workshop was built on the theme of physical activity and healthy lifestyles which saw over 40 participants interact with stall holders; receive cancer awareness information; and receive mini health checks. Reports state that ¹cancer screening invitations is generally lower in BME groups, which can lead to later presentation and poorer outcomes, making this a really important feature of the workshop with a few participants referred to their GP for further checks. Leading a Chair-based Gentle Exercise session was tutor Athina who runs regular classes at Wellspring Healthy Living Centre. The translation and support available through BACWG enabled lots of participants to take part, leading to some exploring what local activities are available in their local area. 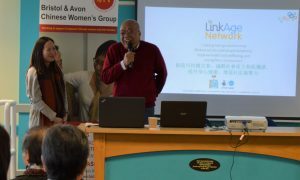 A personal cancer story delivered by BACWG member, Mr Kwok, reinforced the importance of regular cancer screening and seeking support in the event of abnormalities. The presence of Bristol & Weston Bowel Cancer Screening Programme was well-received, with one (of the two) specialist nurses, offering information in Chinese on the signs, symptoms and screening process. Working closely with Dhek Bhal on a women’s Cancer Wellbeing workshop in late November, we were able to learn more about their work providing respite services for carers of South Asian elders, and their Day Centre services for frail and disabled elderly women and men. Together we delivered a two-hour workshop to their Monday women’s group. We found the 25 participants were keen to engage with the stallholders, and information available, in the smaller informal setting. Many participants who attended on the day had a personal experience with cancer, and others attended with the hopes of receiving cancer awareness information. Our Macmillan team delivered a talk, translated into Hindi, on the benefits of physical activity during and after cancer treatment. The talk touched upon the effectiveness of physical activity towards improving mood and boosting energy. This factor was particularly beneficial based on a recent study found that ²British South Asians reported significantly higher rates of depressive symptoms compared with White British patients following a cancer diagnosis. Moving to some lively tunes with Agnieszka, from Wellspring Healthy Living Centre, the group took part in a tailored version of her regular Belly Fit Class. Adjustments were made for some of the ladies who were unsteady on their feet by moving to the beat from the comfort of their chair. Participants learnt about other activities available within a short distance of Barton Hill Settlement. 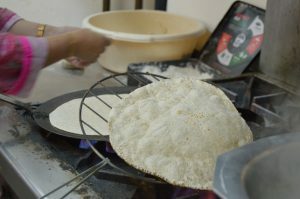 The workshop closed with a nourishing home cooked meal supplied by the talented team at Dhek Bhal who cooked throughout the morning, supplying us with a range of curries, dhal and freshly made chapattis. Through both workshops, participants were treated to complementary therapies by Helena from the NGS Macmillan Wellbeing Centre at Southmead, and fellow therapist Marion. Mini Sound Bath workshops were also delivered through the warm duo Bea and David from Bards of Avalon, demonstrating how relaxation and pain-relief can be achieved through sound. Stallholders included The Care Forum, The Dolphin Society and the Bristol & Weston Bowel Cancer Screening Programme. We would like to thank all the partners who we worked with in 2018 for helping us to raise awareness of the support that is available to people aged 55+ who are living with and beyond cancer. Only by working together did we achieve our aim of informing people of services and activities locally; increasing participant’s social networks; inspiring action, and most importantly having fun. 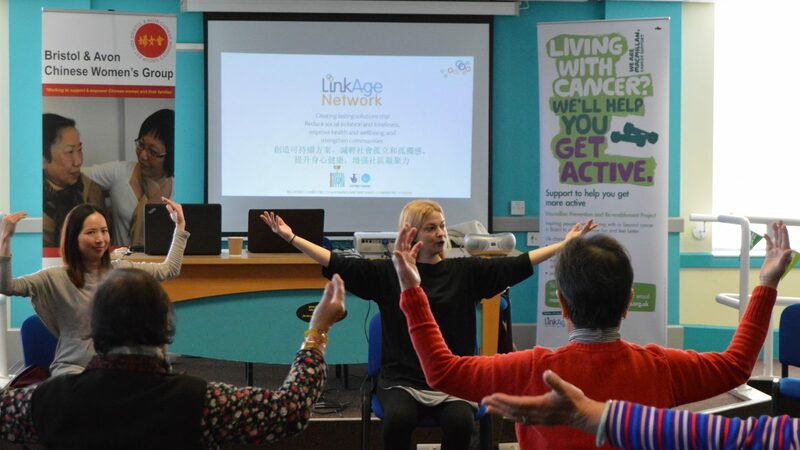 Our collaboration continues into 2019 with a scheduled Cancer Wellbeing workshop for Dhek Bhal’s South Asian Mens group in March; and a Macmillan Activity Week later this Spring. If you would like to find out how you can get involved with the Macmillan Prevention and Re-enablement project in 2019, please contact our Macmillan team on 0117 353 3042 or email macmillansupport@linkagenetwork.org.uk.